Guaranteed to turn more site visitors into subscribers for your Mailchimp lists. This plugin is being actively used on nearly 2 million WordPress sites, has been downloaded over 17 million times and 99% of all users rate it with 4 stars or more. Flexible, user-friendly and good looking sign-up forms for your Mailchimp list. A myriad of integrations to easily subscribe from existing forms on your site. Show your sign-up options anywhere: posts, pages, widget areas, etc. 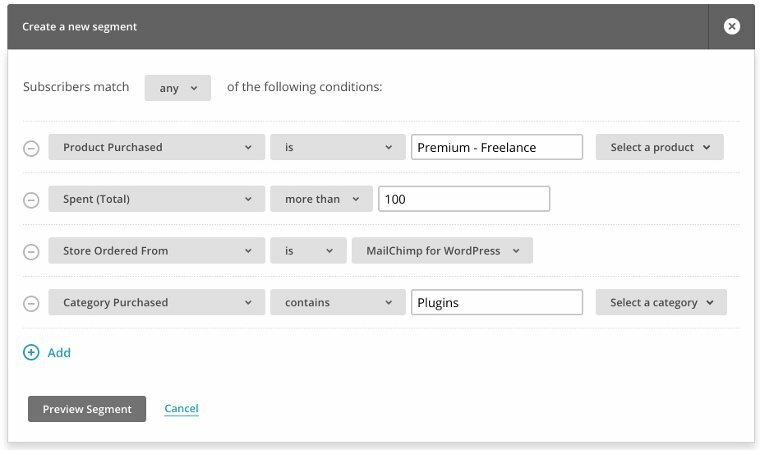 Mailchimp for WordPress is built with extensibility in mind - you get full control. Encourage subscribers to complete their purchase. The feature that pays for itself. Write better emails by collecting important information about your subscribers. More email subscribers, starting today. Create user-friendly & good looking sign-up forms in seconds. 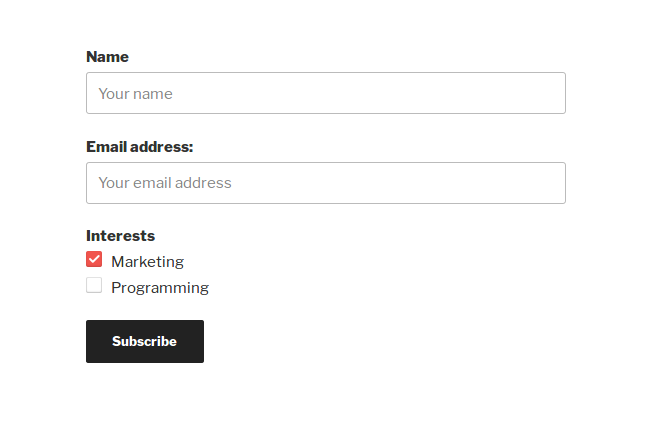 You can have forms subscribe to one or multiple of your Mailchimp lists. You can use custom HTML or use our built-in Field Helper to build your forms. Forms can be shown anywhere on your site. * Forms is a free feature. 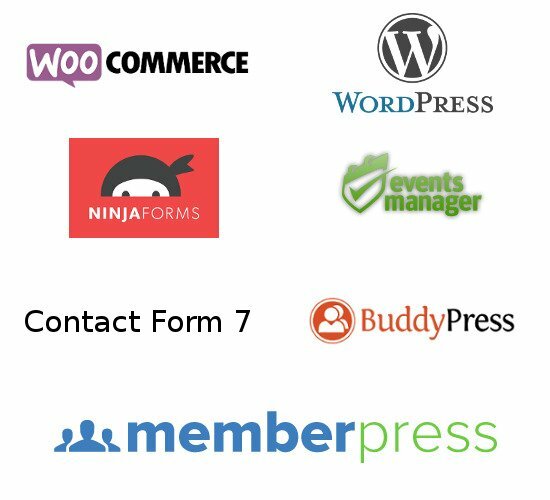 Mailchimp for WordPress offers built-in integration with various others plugins like WooCommerce, Contact Form 7, Gravity Forms, Ninja Forms 3, BuddyPress, MemberPress & several others. These integrations allow you to subscribe your visitors to Mailchimp from any form on your site, like your checkout or comment form. If there is no official integration then the plugin can be extended using a simple programming interface. Whatever plugin you use, we can make it talk to Mailchimp. * Integrations is a free feature. Tightly integrate your WooCommerce store with Mailchimp. See exactly what your subscribers are purchasing, offer them product recommendations based on their purchase activity and recover abandoned carts. Read more about our premium e-commerce integration. * E-commerce is a premium feature. By default, forms will blend in with your site's theme. If you want your forms to stand out, there are several built-in form styles for you to choose from. 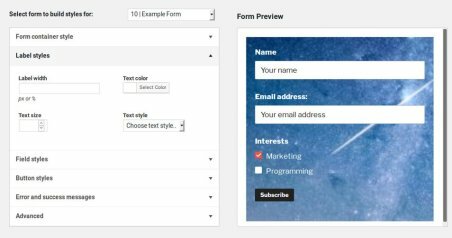 Or use the Styles Builder to customize the form appearance entirely using a visual interface. * Styles Builder is a premium feature. Discover which of your sign-up methods & pages are performing best. 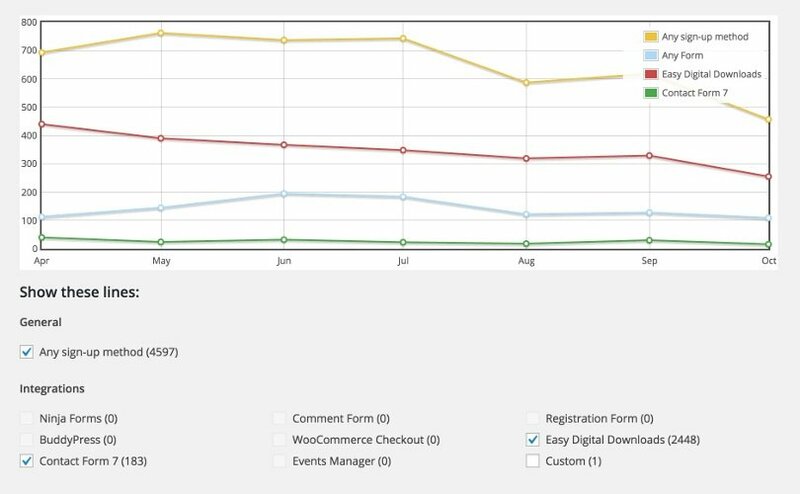 With Reports, every sign-up attempt is logged and then visualized in pretty line-charts. All sign-up data can be exported to CSV with the click of a button. * Reports & Logging is a premium feature. You can start collecting emails from your visitors in just a few minutes. View Pricing or try the free version first. * We offer a 30 day full refund policy, no questions asked.